Easiest way to upgrade your ColdFusion JDK | It is what it is, sometimes it helps. This is a simple process and I'll outline it here. This is the same on Win XP, 2003, Vista, Windows 2008 and Windows 7. Choose the appropriate edition ( I'm running 64bit Windows and CF8 ) so 64 bit edition for me. Make sure you get the JDK not the JRE. Save this and restart your CouldFusion services. Log back into the CFADMIN click Settings and Summary and confirm the java version is now 1.6.0_18. Have you run into any issues in your code after upgrading to version 1.6.0_18? Just curious if there is any potential for broken apps due to the upgrade. Thanks! SO far no issues but the project I am working on currently is ColdFusion back end Flex front end so I can't comment of weather any of the PDF stuff breaks. I'll update when I get our big app running locally. Is there anyway you can do this without access to the cold fusion aministrator? I can't get to it and am hoping an upgrade would fix it. Thanks! Very useful post. Note that the installation is different on JRun4 installations. 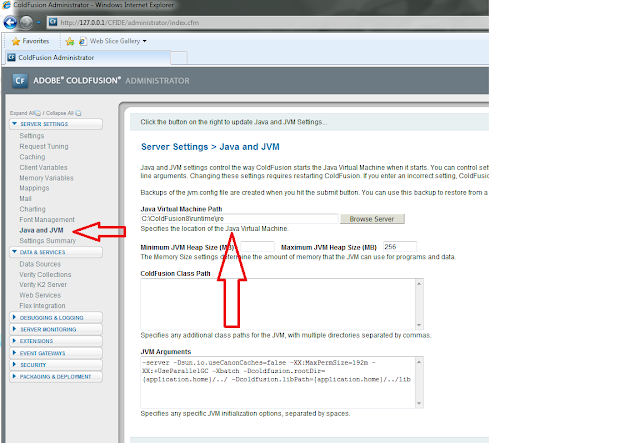 On these installation you have to edit the appropriate jvm.config file, there is no option to do this via the CF Admin.